PCN: Spill! Tell me your favorite moments. A: I’m so overwhelmed that the Slumdog kids won, and by the grand symbolism of the acting awards, just the way the new winners were welcomed into the club by previous winners, some who are legends. That feeling must have been like, Wow. PCN: That was really cool how they had 5 winners come out for each acting award. I gasped when Eva Marie Saint came out to present Best Supporting Actress. A: Me, too! I actually walked up to her and told her how starstruck I was by her. She won an Oscar for On the Waterfront! PCN: Who else were you starstruck by? A: Sophia Loren. They just don’t make ’em like her anymore. And Daniel Craig. He usually looks kinda weathered on screen but he walked by me a couple times and was very debonair, the epitome of a British gentleman. PCN: I need to shove you down the stairs, I’m so envious. I loooove him. Did you ask him if you could take a photo of him holding up a sign saying he loved me back? PCN: OK, let’s go back to the way the acting awards were presented. When the first group of five came out, that was a nice surprise. But then I caught on. I’d seen Kevin Kline walk the red carpet so I thought, “A ha! I’ll bet he’s one of the five presenting Best Supporting Actor!” They also kept cutting to reaction shots of Sir Anthony Hopkins and Sir Ben Kingsley so I figured those were two Best Actor presenters right there. A: That makes me mad! Did they really show them on TV before they presented? A: That makes me mad, because the coordinators worked so hard to keep everyone a secret by having them not walk the red carpet, going in through the back entrance, seated far away from the front row. Joel Grey was practically in the mezzanine so that you couldn’t see him. That’s really sh*tty that you could see them from home before we could reveal them. PCN: Well, I never saw Christopher Walken or Robert DeNiro so those were nice surprises for me. Speaking of being seated far from the front row, where were all those adorable little Slumdog babies placed? A: In the mezzanine. But that’s standard for non-nominated cast members who are in nominated films. PCN: What were they like? A: I don’t even know how to describe them. It’s very touching because it’s been such a long road for them to be at the show. The Oscars, for me, were heightened by the joy they exuded. I’ve never been as excited for a bunch of people I don’t know to win an award as I was for these children. They were glowing, on top of the world, overjoyed. It was pure. 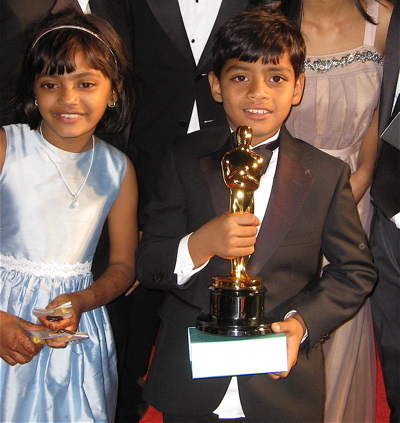 And the littlest Salim [Azharuddin Mohammed Ismail] was asked to carry the Oscar all night. It was so cute. PCN: All right, I have to ask because people want to know. Was someone assigned to keep Brad & Angelina and Jennifer Aniston apart? A: Not that I know of, but there was a close call. Brad and Angelina had left during a commercial break. They went out to the lobby, they were just hanging out, having wine when Jennifer came walking towards them from the other direction. People gasped and freaked out, “Oh no! What’s gonna happen? What’s gonna happen? !” But then Jennifer just turned and went backstage before she got to them. I don’t know if she saw them or someone warned her but she was only a few feet away from them. PCN: It probably would’ve been okay. I think the whole Jen vs. Angie thing is stupid. They probably all moved on years ago. A: Jennifer was a social butterfly. She was very cute. At one point, when she was coming out of the bathroom, she saw Sophia Loren and was like, “Hi!” but then her dress got caught in the bathroom door. She was, like, “This is not a good time for my dress to be caught in the door.” It was a very Rachel moment. At another moment, my jaw just dropped because in this one small room, Jennifer, Reese Witherspoon, Sophia Loren, Halle Berry, Marion Cotillard and Nicole Kidman were all getting their makeup done. I just could not handle it. PCN: That’s really something. Now, I know things look different on TV so who was best dressed in person? A: You don’t like her? PCN: She kept telling everyone on the red carpet she hopes to be back at the Oscars next year and get something for The Hannah Montana Movie. I mean, Dream on, honey. PCN: So, who else looked good? A: Marion Cotillard looked really good. Diane Lane—I love her. Nicole Kidman and Penelope were very “them,” wearing what we normally expect of them so there were no fashion risks. Robert Downey Jr. looked like he did in The Pick-Up Artist [his 1987 comedy with Molly Ringwald]. PCN: He did look like he aged backwards! How about worst dressed? A: Shirley MacLaine. What was that?! For males, Mickey Rourke and Adrien Brody. PCN: Adrien Brody could’ve done the Joaquin impersonation with that beard instead of Ben Stiller. PCN: Overall, did everything go as planned? A: I would say so. I thought it went really well. Not a bad get….The Jennifer Aniston moment with Sophia Loren, that was amusing. Did Ms. Loren move on? Or did she wait for Aniston? My source said Aniston had a brief conversation with Ms. Loren while her dress was caught in the bathroom door. Such a sitcom moment! During the few moments I could actually tolerate the awards, I kept wondering if anyone actually wrote the dialogue? Does anyone know? THEY REALLY NEEDED A WRITER! I didn’t think the banter was that bad, ScriptPimp. We’ve heard much worse. Maybe it was because some presenters actually managed to make it sound breezy and funny, i.e. Tina Fey and Steve Martin, Will Smith during the Action Yearbook sequence (Will can make anything sound breezy), and Reese Witherspoon naming Ben Stiller as a difficult actor who doesn’t come out of his trailer. Ugh, I had almost forgotten how bad the group of films were this year til I saw the clips. Maybe some of the backstage drama should have been moved frontstage. Can you tell me when Tilda Swinton will be doing the role she was born to do? You know, the lead in the upcoming David Bowie biopic? Ha ha! Funny, FFBUFF8! The likeness is striking. Was it just me or did everyone start to miss the Snow White and Rob Lowe duet whenever Hugh decided to sing? No, never! That Rob Lowe and Snow White number still gives me nightmares. Love these backstage insights, PCN ~ Thank you! Great twin spotting, FFBuff8. I knew she reminded me of someone. I wish to heck Jen and Brangelina would meet up and have a few laughs together in public so that everyone else can move on too. Hollywood is filled with ex-es going out with other people’s ex-es. The avoidance perception only continues the drama. It’s not like they need the publicity! I agree, ShelleyP. Angelina and Jennifer should show up on Oprah holding hands and sharing baking tips.